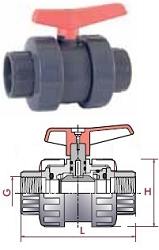 * Manual uPVC / ABS Double Union Ball Valve Colour Grey. / Light Grey - ABS only available in Plain Imperial socketed. Prices next page. * End Connections std. are plain (22A) Imperial or Metric sizes (22AM) or BSPf. (23A) Flanged versions available by request. * ¼” NPTf Single piece PVC valves with EPDM seals, also stocked. *Industrial Versions can have electric or pneumatic actuators fitted. Everyvalve recommends full suitability first check of the service. 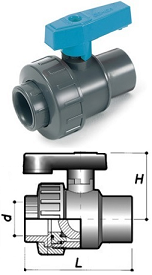 Sizes : 3/8" - 4"
Manual uPVC Double Union Ball Valve Colour Grey. End Connections STD. are Plain Imperial (..610) or metric sizes (..610m) or BSPf (..616). PTFE Seated with EPDM seals as std, Compression Version 02P616CO . Check suitability. End Connections STD. are Plain Imperial (..302) or metric sizes (..302m) or BSPf (..301). PTFE Seated with EPDM seals as std . 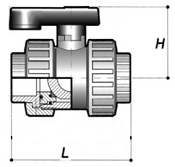 * Manual Valves are manufactured in Grey uPVC. Prices next page. * End Connections are BSPf. Simple economy easy to use compact valve. * EPDM Seals are standard (Spares are not available). 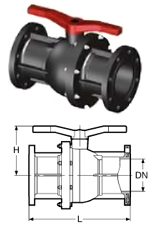 * Valves Manufactured in Black Glass Reinforced PP with PTFE Seats. * EPDM Seals are Standard ( FPM Special at extra cost ) - Spares Are Available. * Flanged Codes For Valves ".." HH = BS10 Table E, FF = PN16, GG = ANSI 150. * All Valves Have A Metal Insert rein. 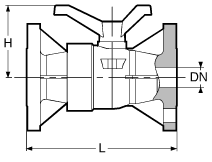 In Drive Spindle. * Actuation Versions Suitable For Electric Pneumatic Actuators. * PVDF Body Special at extra cost For 1/2" - 2" BSP Version. * Codes For Valves ".." HH = BS10 Table E, FF = PN16, GG = ANSI 150. 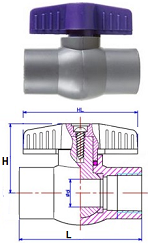 * Single Union Valves Has BSPF Thread Each Side. Fixing Means Of Valves Are On One Sid. All Dims. in mm. * Valves Manufactured in Black Glass Reinforced PP with PTFE Seats. Tee Handle. * EPDM Seals are Standard ( FPM Special at extra cost ). * Sandwich Valves Have Tie Bolts Retaining the BSP Threaded End Connections & no Union Nut. Lever Handle.